According to the nutrition label on my bag…3 donuts made up 1 serving and there were 7 servings in the whole bag. Well in less then 24 hours I ate the whole bag. 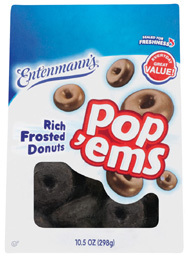 Lets see at 230 calories per serving, that means I ate 1610 calories in just donuts. Nevermind what else I ate within the last 24 hours….hmmm, pasta salad, chocolate pudding, saltine crackers with peanut butter, naked juice & vodka. It all adds up to a ton of calories and none of it was very healthy. Now that the donuts are gone, maybe I can just grab the apples to eat whenever I get the munchies today. Later this evening there is a “free” community dinner. I think TraceyJo told me that some Tuna Melt Casserole was on the menu this week. Well I guess I know why my waist is getting bigger.